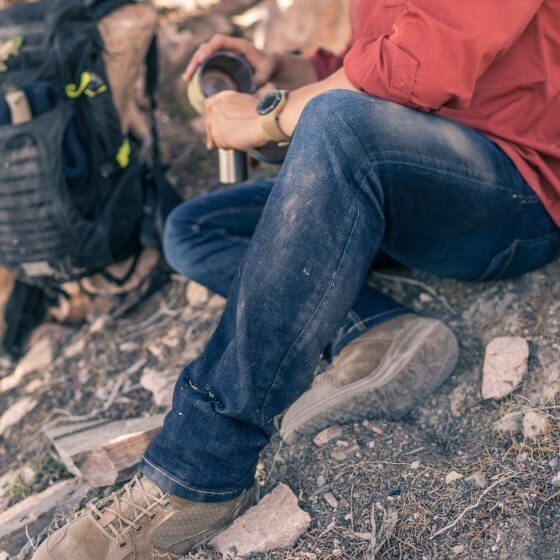 5.11 Tactical Defender Flex Jeans Review — Clifford Associates, Inc. The biggest technical difference between the Defender-Flex series and your dad’s old Levi’s or Wranglers is the fabric. The Defender-Flex jeans are composed of Lycra T400 Tough Max, a cotton/polyester-blend fabric. The manufacturer claims Tough Max fabric is twice as strong as regular 100% cotton denim. It’s also said to have higher tear and tensile strength than cotton, as well as high abrasion resistance. The label lists the composition as 76% cotton and 24% polyester. Defender-Flex pants use a slightly different fabric than the jeans, resulting in a smoother finish and slightly more stretch. The label on the pants lists composition as 66% cotton, 31% polyester, and 3% elastane (also called Spandex or Lycra). Aside from this fabric and different color options, the jeans and pants are identical. In addition to this modern fabric, 5.11 Tactical added extra-thick hems and stitching to further reinforce key wear areas, such as the button closure and edges of the front pockets. There are 8 belt loops, three on each side and a pair at the rear. These loops are slightly thinner and more pliable fabric than those found on Levi’s, but at 3/4-inch wide they’re about 30% wider than the Levi’s loops. Tough brass rivets emblazoned with “5.11” text and a brass button with the 5.11 logo serve as subtle finishing touches. The other distinctive characteristic of the 5.11 Defender-Flex is its pockets. Each pair offers a total of 7 pockets. We’ll list them below along with the pocket dimensions, and how they compare to the pocket dimensions on a pair of Levi’s 505 jeans.